This is an archive of Futurepast's Carbon Counting Blog from 2009-10. The US Securities and Exchange Commission (SEC) on January 27, 2010, approved interpretive guidance on climate change reporting for publicly traded companies. The new guidance is intended to clarify the circumstances in which existing SEC regulations require companies to disclose climate change–related information that could have “material” financial impacts. The text of the guidance will be published soon in the Federal Register. •	Physical impacts of climate change. Investors and environmental advocates in 2007 had urged the SEC to issue guidance on disclosure of climate-related impacts. Petitioners included pension funds, state treasurers, investor advocates and environmental groups, among others. SEC chairman Mary Shapiro made clear in remarks at the hearing that adopted the new interpretative guidance that the SEC is not changing regulations related to disclosure of material information to investors. Rather, the new guidance will help companies interpret existing disclosure rules with respect to climate change–related financial impacts. The SEC’s action should prompt more companies to collect, analyze and report on climate change information. Companies that do not do so face added risks of litigation or regulatory action if future developments show that management failed to disclose material financial impacts linked to climate change. Actions against companies have already occurred. In 2008, the New York state attorney general set a precedent when he negotiated an agreement with Xcel Energy to disclose climate change information after subpoenaing the firm for information related to the construction of a new coal-fired power plant. In October 2009 the US Environmental Protection Agency issued a new regulation requiring approximately 10,000 US facilities to report their emissions of greenhouse gases, starting in January 2010. For affected companies that had not previously counted GHG emissions, the US EPA regulation imposes the requirement to do so. The facility-based regulation, however, does not require corporatewide accounting, and not every public company is covered by the regulation. Moreover, companies will have to analyze the data they collect in order to calculate potential financial impacts. Companies that do not currently report GHG emissions information at the corporate level have several options with respect to standards. The most widely used corporate reporting standard in North America is the GHG Protocol, published by the World Business Council on Sustainable Development/World Resources Institute. The GHG Protocol formed the basis for the General Reporting Protocol of The Climate Registry, a non-profit organization that accepts voluntary GHG reports from organizations based in the USA and Canada. The Carbon Disclosure Project is another venue for companies to report GHG information. Finally, ISO 14064:2006 Part 1 offers a concise set of requirements for quantification and reporting of greenhouse gas emissions at the organizational level. The SEC announcement puts into question the fate of an ASTM International standard that was developed to provide guidance on the same topic. According to Gayle Koch of The Brattle Group, technical contact for the recently balloted standard, if the proposed ASTM Guide for Financial Disclosure Attributed to Climate Change has been incorporated in the SEC document, there may be less reason to publish it. On the other hand, if the ASTM document adds significant value after taking into account the SEC interpretive guidance, ASTM is more likely to publish it and include in it a reference to the SEC guidance. The text of the SEC guidance is closely held, and not expected to be known until its publication in the Federal Register. Climate change can have material financial impacts on companies. Where their magnitude can be estimated, they should be disclosed by companies regulated by the SEC. Privately held companies should also quantify these impacts for strategic planning purposes. Moreover, companies should consider information they may release voluntarily to greenhouse gas registries or to mechanisms such as the Carbon Disclosure Project when they are preparing regulatory filings to the SEC. Companies that quantify their GHG emissions in accordance with one or more reporting protocols or standards should consider, as a matter of quality assurance/quality control, hiring a third party to verify their inventory reports. This is equally true whether the company is required to report its emissions to a state or federal regulatory body, or whether the company gathers the information for strategic planning and potential disclosure under applicable SEC regulations. Futurepast can perform this service as an internal audit or recommend qualified and accredited third-party verification bodies. In “Tips for Greenhouse Gas Project Developers, Part 1” (2010-01-17), we discussed the important project attributes of emission baselines and additionality, and described how a “performance-based” project protocol differs from the model employed in the Kyoto Protocol’s Clean Development Mechanism (CDM). There are multiple audiences for a PDD. The first audience is internal. A PDD describes the project in detail, including relevant GHG sources, sinks and reservoirs; emission reduction or removal enhancement quantification methodologies, and the number of tons of CO2-e that the project is expected to create. The PDD also defines requirements for quality control/quality assurance and for monitoring and measurement. It may discuss applicable crediting periods, plans for validation and/or verification, and plans for registering project offset credits. A second audience for the PDD is an organization that may provide project financing prior to the creation of the offset reductions, or a prospective purchaser of offset credits. Both a carbon financing source and a buyer use PDDs as initial screens for identifying potentially attractive projects and making preliminary assessments of risk. The third audience for a PDD is the project’s validation or verification body (VVB). VVBs use PDDs to assess audit risk and to develop verification plans and data sampling plans. Because the PDD is often the means by which outside parties are first introduced to a project, the document should be carefully prepared. It should make a convincing case that the project is eligible, additional, and monitored, and that emission reductions or removal enhancements are (or will be) properly quantified and reported. A central element of the PDD is the monitoring plan. This section of the PDD describes the need for and purpose of monitoring, and the types of information to be tracked. It discusses where monitored information comes from, and what monitoring methodologies are employed. The latter can include estimation, modeling, measurement or calculation. The monitoring plan defines intervals for monitoring, and discusses roles and responsibilities. It describes any GHG information management systems to be employed, such as automated equipment and data loggers, and specifies the location and retention time for stored data. The monitoring plan also describes plans for calibration and maintenance of monitoring equipment, and includes or refers to procedures needed to carry out the monitoring function. Monitoring plans should provide for tracking regulatory compliance and other eligibility criteria as well as applicable flows of gases, fluxes in carbon stocks, project emissions, project leakage and changes to the baseline scenario. A well designed PDD is essential for proper project implementation. It can open the door to project financing and sale of credits, and ease validation and verification. Project developers can undertake this important task on their own or engage the help of qualified consultants, such as Futurepast. Recent publicity surrounding the climate change negotiations in Copenhagen raised public awareness about the need to transition to a low carbon economy. As a result, inventive people are thinking about new ways to avoid, reduce, or sequester carbon dioxide. But where to start? The following diagram illustrates the basic concepts of a baseline scenario, the calculation of emission reduction credits, and a time-limited project. The diagram shows a flat baseline—that level of GHG emissions that would be expected to exist in the absence of the GHG project. The curved line on the graph illustrates how a project might reduce GHG emissions compared to the baseline scenario. In the example, GHG emissions decline relative to the baseline as a result of project activity, and then level out. Emission reductions, then, are represented by the quantity, measured in metric tons of CO2-equivalent, of emission reductions achieved by the project compared to the baseline. The solid line shows a finite crediting period, which for many projects is 10 years. After that time period, the project may still generate emission reductions, but no longer earn offset credits. Projects are implemented for many reasons. It is important to keep in mind that the project developer has to demonstrate that the project activity is “additional to” what would have occurred in the baseline scenario. Some projects do not qualify for the issuance of carbon offset credits because they fail this test of “additionality.” For example, the US EPA regulates large municipal solid waste landfills. Once a landfill’s design capacity exceeds 2.5 million metric tons or 2.5 million cubic feet, the landfill is required to install a landfill gas collection and combustion system to control nonmethane organic compound (NMOC) emissions. The same requirement is triggered if the landfill emits more than 50 metric tons per year of NMOCs. Consequently, such a landfill could not claim greenhouse gas emission reduction credits if it installed a landfill gas capture and combustion system after crossing the regulatory threshold. Another test of additionality is “common practice.” In other words, if everyone else is doing it, because it makes good business sense, the emission reduction activities may not qualify as “additional.” How common practice is defined is subject to interpretation, so people who pass judgment on these things apply other tests as well. We’ve discussed the “regulatory additionality” test already. Other tests are technology and financial. The technology test is met when the project uses a technology that has been approved for GHG crediting by a GHG Program. Prominent GHG programs include the Clean Development Mechanism (CDM) of the United Nations Framework Convention on Climate Change (UNFCCC), the Climate Action Reserve, and the Chicago Climate Exchange. It should be apparent that judgments about “additionality” can be tricky to make. Fortunately, there are many cases where a case-by-case determination does not have to be made. This occurs when a project is developed that meets a specific “performance standard” established by a GHG program. The term “performance standard” means that if a project fulfills all the criteria set out in a project methodology or protocol, then it is deemed by the GHG program that issued or recognized that methodology/protocol to be additional. Project protocols developed by the Climate Action Reserve in the United States are of the “performance standard” type. A project developer need only find a suitable CAR protocol, fulfill all its requirements, have the project verified, and credits will be issued. In the CDM, by contrast, a project developer follows an approved methodology, or proposes a new one. Next, the project developer hires a GHG validation body to “validate” the project. Validation means that an auditor examines the project design, scrutinizes the monitoring plan and other project controls, and renders a decision about whether the project, if properly implemented, will generate GHG offset credits that are real, additional and permanent. Validation of the project takes place prior to implementation. Once the project has been validated and implemented, verification that the planned emission reductions have been achieved is also required. In North America, the project protocols of most GHG programs are of the performance-standard type. However, the Voluntary Carbon Standard (VCS) is one notable exception. It issues offset reduction credits for projects that, in most cases, have followed a CDM methodology and have been validated and verified. I say “in most cases” because VCS also has a mechanism whereby a project developer can propose a new methodology and have it accepted if it passes muster by two independent validation bodies. Would-be project developers face a steep learning curve when implementing projects for the first time. The field is highly technical, requires a thorough understanding of complex sets of rules, and demands attention to detail during implementation. For this reason, the use of project consultants from firms such as Futurepast can be highly cost-effective. An emerging focus of managing climate change risks centers on greening the supply chain. Organizations do this for a variety of reasons. They want to ensure the dependability of the raw or intermediate materials they source, and materials produced and transported in an environmentally sound manner have lower risk profiles. They take an interest in the readiness of their supply chain partners to meet new greenhouse gas regulatory requirements and to absorb potentially higher or more volatile energy costs. And they seek to protect their corporate reputations by dealing with supply chain partners that conduct their businesses sustainably and in compliance with legal requirements and ethical principles. Other Indirect emissions can be more difficult for organizations to quantify and report than either Direct or Energy Indirect emissions. Often, the data needed to inventory these emissions reside outside the reporting organization in its supply chain, and are difficult to access. Complicating matters further are questions of allocation, which arise when a supplier furnishes a diverse set of products for multiple customers and then is asked to account for only the emissions associated with a subset of those. Practical questions include “how much to count,” and “how far upstream and downstream” the supply chain accounting should go. Requests for business-to-business greenhouse gas emission information are becoming more common, and are likely only to increase. Business customers, particularly those with well-known brand names to protect, want assurance that suppliers are managing their risks, including those related to climate change. The concern does not stop with emissions accounting, as a broad examination of climate risks include physical risks from climate change, regulatory risks, and shifting consumer preferences. The first category of risks includes increased frequency of extreme weather conditions, flooding and sea level rise, and changing temperature and rainfall patterns. Resource scarcity is a corollary impact from climate change, which may be triggered by decreasing biodiversity, higher rates of disease, or an increase in desertification. Regulatory risks include the potential imposition of cap-and-trade programs, carbon taxes, or requirements for installation of Best Available Control Technology (BACT). Changes in consumer preferences can impact organizations by shifting consumption from one product category to another, enhancing or harming reputations, and creating markets for new products and services. For companies whose primary customers are other businesses, meeting the demand for information concerning their greenhouse gas emissions and other climate risk management strategies can be challenging. Many corporate staffs find it difficult to respond, with in-house expertise thinned and overextended. What’s more, the desired response from customers seeking climate change related information is not satisfied with the provision of a copy of the supplier’s environmental policy or ISO 14001 registration certificate. Real data are demanded that meet data quality standards and adequately characterize uncertainty. Help is available from specialized consultancy firms like Futurepast. And new international standards and consensus-based protocols are under development. One of the first documents specifically to address supply chain reporting of greenhouse gas emissions is the Scope 3 Accounting and Reporting Standard, to be published as a Supplement to the GHG Protocol Corporate Accounting and Reporting Protocol. This document is available in draft form (November 2009) from the Greenhouse Gas Protocol Initiative, at www.ghgprotocol.org/standards/product-and-supply-chain-standard (accessed on 2010-01-10). The International Organization for Standardization (ISO) also has begun to develop a document. ISO Technical Report 14069, Greenhouse gases – Quantification and reporting of GHG emissions for organizations (carbon footprint of organizations) – Guidance for the application of ISO 14064-1, is intended to complement the ISO 14064 Part 1 standard published in 2006. Publication of the ISO technical report is not likely before the end of 2012. Futurepast’s president, John Shideler, serves as a US Expert on the ISO working group developing this document. The main purpose for counting Other Indirect emissions is, of course, to manage them better. Once quantified, organizations in all parts of the supply chain can focus on initiatives to design more sustainable products, improve energy efficiency in manufacture, optimize transportation and logistics resources, and promote end-of-life recycling. Some observers will see connections to other business planning tools such as Six Sigma and Lean Manufacturing which now will be applied to help meet the goals of reducing carbon emissions and managing climate risks. New Year’s resolutions may date back millennia, perhaps as far as early Babylonian times. In the modern era individuals may make solemn commitments to lose weight or exercise more. Meanwhile, organizations set about to achieve quality and environmental objectives while maintaining or improving financial performance metrics. Fortunately, when it comes to climate change resolutions, organizations—and individuals—can often achieve win-win outcomes. In this spirit Futurepast offers its Top Five Climate Change Resolutions for Organizations in 2010. We rank as number five the establishment of an organizational inventory of greenhouse has emissions. For leading organizations, GHG inventories are not new. However, getting one is the place to start for organizations that have put off formal consideration of the carbon intensity of their operations and products. An inventory allows companies, governmental units, and other types of organizations the chance to quantify how much carbon dioxide equivalent gases they emit on an annual basis. The inventory is broken down by type of emission, such as Direct Emissions from stationary and mobile combustion, as well as process and fugitive emissions. Another category is Energy Indirect Emissions, which acknowledge how an organization’s demand for purchased electricity or steam frequently causes utility companies to combust fossil fuels to produce the energy an organization needs. A third category of accounts is Other Indirect Emissions which includes emissions associated with both the upstream supply of raw and processed materials an organization uses as well as the downstream effects of the products and services it furnishes to the market. Transportation of these materials, goods and services typically are also included in the upstream and downstream calculations. Definitely, if your organization doesn’t already have one, now is the time to establish an accurate and verifiable GHG inventory. Number four on our list of resolutions for the New Year is to obtain information from your supply chain about the carbon intensity of their inputs to your organization’s activities. Leading companies like Walmart have pioneered in this field, and more and more market leading organizations understand the importance of doing so. It comes down to sustainability. Simply put, organizations that are not able to reduce their carbon footprint in the coming years run the risk of falling behind their competitors and losing market share. This is bad for them, their customers, and other stakeholders. Now that market leading organizations have inventoried their carbon emissions and considered ways to reduce them, the next logical place to look is in the upstream part of the value chain. Our number three resolution is to use the organization’s inventory to set emission reduction targets. An inventory allows organizations to see clearly where their most carbon-intensive operations or activities lie. Armed with this information, objectives for performance improvement can be set. This typically occurs at the highest level of the organization during periodic exercises known as “management reviews.” Top management sets the direction, assigns responsibilities and time frames, and allocates the resources necessary to achieve the targeted improvements. Futurepast’s second most important resolution for organizations this year is to communicate its GHG performance and improvement objectives to stakeholders. The audience for this communication is both internal and external. Employees must understand the message so they can take needed actions to meet the organization’s climate change objectives. Suppliers need to know what part of the value chain the organization has identified as bearing the highest potential for targeted emission reductions, so they may rise to the challenge and deliver them. Customers are an important audience as well, because increasingly they will make business-to-business or consumer decisions based upon least intensive carbon options, when all other factors are equal. Last but not least, the investor community has a growing desire to know how the organizations they own are meeting the climate change challenges of the twenty-first century. Indeed, in some cases, climate change disclosures may already be called for in securities regulations in those cases where a publicly traded company has determined that a reasonable person could be influenced by its climate change risks and management’s decisions about how to address them. This year we cap our suggestions for resolutions with our number one recommendation: Reduce the carbon footprint of your organization’s activities and products. Implement actions that reduce consumption of energy, squeeze carbon emissions from the upstream supply chain, and reduce the carbon footprint of products over their life cycles. Increase the efficiency of lighting and heating/cooling systems, optimize distribution networks, reduce packaging, and improve recyclability. Encourage employee car-pooling, transit use or biking to work. Like the individual that goes on a diet and exercises more, organizations that produce equivalent products and services that use less materials and energy will gain an edge in the competitive marketplace and augment its appeal to customers. And in the classic win-win way, it will achieve these benefits while benefiting the organization’s bottom line. Futurepast extends its greetings at this time of year to its clients, friends and associates. As good wishes and New Year’s resolutions are customary at this time, we hope the New Year will bring increased peace, harmony and prosperity to all. We resolve to update this site with information on topics of interest to individuals interested in climate change and greenhouse gas management, enhancement of management systems for optimal performance and results, and accurate and transparent environmental communication to stakeholders. And we ask our stakeholders to monitor this space and share their observations and comments with all of us throughout the coming year. Happy New Year to all! COP-15 Accord Breaks New Ground In Voluntary Commitments from China, India and Brazil; Could an ISO GHG Management System Standard Help with Verification? The COP-15 negotiations in Copenhagen did not produce a new treaty to succeed the Kyoto Protocol. This left many countries and observers bitterly disappointed. It also left in doubt the future beyond 2012 of institutions spawned by the Kyoto Protocol such as the Clean Development Mechanism and the program of Joint Implementation, both “flexible mechanisms” of Kyoto that produce tradable carbon offset credits. But the agreement brokered by US President Barack Obama did accomplish one goal the US has long held dear. It formally committed the world’s largest greenhouse gas emitter, China, to concrete goals for greenhouse gas emission reductions. At Chinese insistence these goals will be based on reducing the intensity of China’s growth in future emissions rather than in absolute cuts. And for now, no text has been agreed to that will give China’s or any other country’s emission reduction targets the force of international law. Nonetheless the largest of the world’s most rapidly industrializing developing countries have agreed to set targets, and that principle is important. Many details of the new agreement have been left for resolution to future meetings. One of the most contentious is the verification regime that will permit assessment of the progress developing countries make on achieving targeted reductions. President Obama insisted that independent verification was essential and that all countries should consent to it. Earlier in the talks the Chinese had insisted that its sovereignty was at stake and that it would certify the results of actions taken without the involvement of outside parties. While the details are not yet clear, President Obama’s direct negotiations with the Chinese premier on Friday Dec. 18 appeared to have succeeded in obtaining China’s agreement to some acceptable form of monitoring and verification. Transparency was a major theme of the COP-15 before the international leaders arrived on the scene for conference’s waning days. At an earlier COP the principle had been agreed to that emission reductions from developing countries should be “monitored, reported and verified”—or MRV’d for short. The MRV concept specifically was to be applied to “Nationally Appropriate Mitigation Actions” that developing countries take on a voluntary basis. Hence the interest of having the largest emitters in the rapidly industrializing world, China and India in particular, set targets and agree to some kind of regime for monitoring and verification. It was left to a future meeting—perhaps the COP-16 in Mexico City in December 2010—to flesh out the details for monitoring, reporting and verification. In the meantime ISO—the International Organization for Standardization—presented a concept at a side event cosponsored by the United Nations Framework Convention on Climate Change (UNFCCC) for a greenhouse gas management system standard that could be used by national governments—or regional or local subunits of governments—to manage, monitor, report and verify climate change mitigation actions. The outline of such a standard was presented by the US-based United Nations Foundation, an advocacy group, and commented on by an Indonesian delegate to the talks in his capacity as Vice Chair of ISO Technical Committee 207 Subcommittee 1 on Environmental Management Systems. Last week in my blog I described the standards published by ISO TC 207 Subcommittee 7 on Greenhouse Gas Management and Related Activities which would also support this management system approach. The ISO approach is valuable for at least two reasons. First, it provides a framework for countries, regions, or communities to manage climate change mitigation actions at the operational level. A management system provides a ready framework for capacity building and technology transfer, which is just what the developing world needs to implement mitigation actions. Second, it provides assurance to countries furnishing climate change mitigation assistance that their investments in hundreds of locations throughout the world are properly deployed and that results are monitored, reported and verified. ISO management system standards, in particular ISO 9001 for quality management and ISO 14001 for environmental management, are some of the most popular and widely adopted management system standards in the world. There is no doubt that a management system standard for climate change mitigation could be developed on an accelerated timetable and that it could be of enormous importance in achieving the verification objectives set forth in the Copenhagen COP-15 accord. Third-party verification could be achieved by bodies independent of any national government or the UNFCCC while at the same time augmenting the effectiveness of the Nationally Appropriate Mitigation Actions. Negotiators at the fifteenth “Conference of the Parties” to the Kyoto Protocol, meeting in Copenhagen, enter their final week with eyes focused on the text of an agreement to reach a new international agreement to reduce greenhouse gas emissions. Heads of state are gathering during the coming days to commit their countries to concrete actions to curb climate change. At the meeting developing countries are pressing developed ones to lead the way in abating concentrations of atmospheric greenhouse gases that have risen steadily since the beginning of industrialization in the eighteenth century. Developed countries, the developing ones say, have benefitted disproportionately from the industry and trade that are associated with the rise from approximately 250 parts per million of atmospheric CO2 in 1750 to the 385 parts per million that now are accumulated in the troposphere. This rationale explains the “common but differentiated responsibilities” that underlie the 1992 United Nations Framework Convention on Climate Change. While the daily to and fro of high-level negotiations grab most media attention, discussions of myriad details related to climate science, sectoral emission reduction approaches, and institutional mechanisms take place on the sidelines. 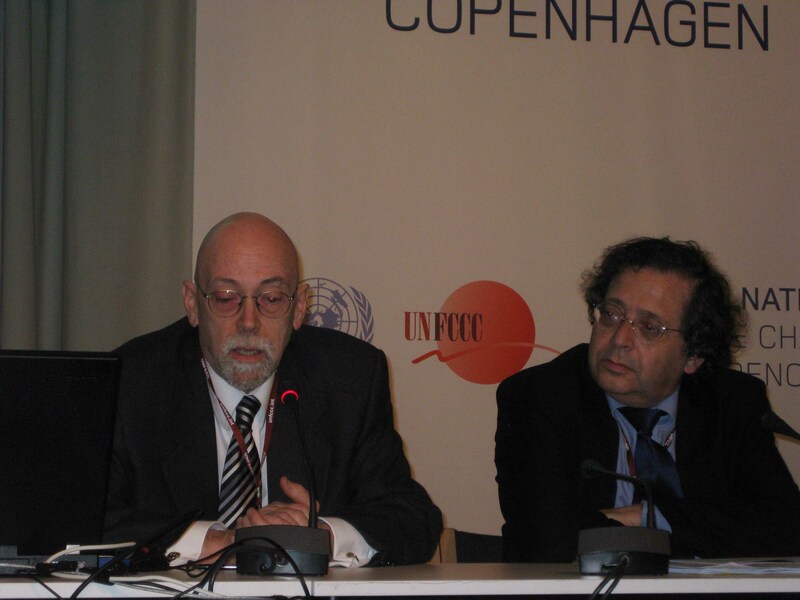 Two “side events” at the COP-15 involved ISO, the International Organization for Standardization. More than 160 countries are members of ISO which is based in Geneva. Since 1947, ISO has developed more than 17,000 standards in support of international trade. One of these side events, co-sponsored by the UNFCCC, offered delegates a perspective on how a proposed international greenhouse gas management system standard might support the implementation of NAMAs at both national governmental and local levels. Another side event, sponsored by the International Emissions Trading Association, highlighted existing ISO greenhouse gas standards and their role in promoting governance, trust and integrity in emissions markets. I had the privilege of representing ISO Technical Committee 207 Subcommittee 7 as a standards expert in these two side events. In both sessions I explained the purpose and role of published standards on greenhouse gas quantification and reporting at the organizational and project levels (ISO 14064:2006 Parts 1 and 2). I also described published standards on greenhouse gas verification (ISO 14064:2006 Part 3) and requirements for greenhouse gas validation and verification bodies (ISO 14065:2007). Our technical committee has forthcoming standards on the competence of greenhouse gas validation teams and verification teams, the carbon footprint of products, and guidance for the establishment of greenhouse gas inventories. ISO standards facilitate capacity building by providing benchmarks for training, certification of personnel, and accreditation of the bodies that oversee these activities. They play an important role in helping organizations achieve the objectives they set for themselves—or that are set for them by local ordinance, national law or international agreement. ISO standards define the rules by which independent verification bodies can audit the “greenhouse gas assertions” made by organizations at the entity, facility or project level. ISO greenhouse gas standards currently support emissions trading in both voluntary and regulatory markets. Future standards will offer organizations a means to identify the carbon footprint of products and thereby influence greenhouse gas emissions intensity within a supply chain. Voluntary, consensus-based ISO standards stand ready to underpin the negotiated agreements reached by countries under the United Nations Framework Convention on Climate Change. The American National Standards Institute (ANSI) is a national accreditation body that has led its peers in establishing a greenhouse gas accreditation program for validation and verification bodies. ANSI’s program began in 2008 and by December of that year had accredited in a pilot program its first seven greenhouse gas verification bodies to ISO 14065:2006, Greenhouse gases – Requirements for validation and verification bodies for use in accreditation or other forms of recognition. In the year since those first seven bodies were accredited, ANSI has given its approval to six more. Other countries that have launched accreditation programs for greenhouse gas verification bodies include Australia-New Zealand, Brazil, Canada, Japan, Mexico, Korea and Taiwan. Moreover, ANSI has received applications from greenhouse gas validation and verification bodies from outside the United States, in particular, China. European greenhouse gas validation and verification bodies are accredited to EA 603, a European Union regulatory document. Accreditation is a process whereby a third party, in this case ANSI, attests to the competence of the greenhouse gas validation or verification body (GHG VVB) to perform services. Competence is demonstrated by the GHG VVB through its maintenance of documented procedures and records, and through performance of witnessed validation or verification engagements. Accreditation is not a one time event. The accreditation body conducts annual surveillance audits of the GHG VVB that include witnessing additional validation or verification engagements and assessing conformity with documented requirements at the offices of the GHG VVB. The object of the surveillance assessments is to ensure that the accredited bodies continue to meet the requirements of ISO 14065 and conduct their validation and verification audits in conformity to ISO 14064-3 and any applicable GHG program requirements. How does accreditation benefit the consumer of greenhouse gas validation and verification services? The end-use customer benefits in many ways. The customer has assurance that a competent body has evaluated the GHG VVB and found that their program meets the requirements of ISO 14065 and that the validation or verification audit will be conducted in accordance with the requirements of ISO 14064-3 (Greenhouse gases – Specification with guidance for the validation and verification of greenhouse gas assertions). The customer can rely upon the accreditation body to maintain a process for handling appeals or complaints that the customer may raise against the decisions reached or actions take by the GHG VVB. The customer can expect the marketplace to ascribe value to the placement of an ANSI accreditation mark on a greenhouse gas statement issued by an accredited GHG VVB. I serve as a member of the ANSI Greenhouse Gas Validation-Verification Advisory Committee in my role as Greenhouse Gas Program Manager for NSF-ISR, one of ANSI’s accredited GHG VVBs. In Copenhagen this week I will be discussing ISO 14064-3, ISO 14065, and the use of other ISO greenhouse gas standards in two separate side events at the COP-15 meeting as an accredited member of the ISO delegation. The purpose of those side events is to communicate to COP-15 negotiators what International Standards and accreditation infrastructure already exists to support governance, trust and integrity in the emissions markets. International negotiators arrive in Copenhagen the week of December 7 to begin two weeks of hard negotiation on the framework for a “post-Kyoto” agreement on climate change. For at least the last two years this meeting of the fifteenth “Conference of Parties” has been portrayed as Earth’s last chance to strike a deal to control manmade emissions of carbon dioxide and bring the United States into concert with Europe, Japan and other highly industrialized economies that ratified the Kyoto Protocol. The United States is now more willing to participate in a binding international agreement but is still concerned about leaving China, India and other rapidly industrializing countries without defined emissions targets. Recently China surpassed the United as the world’s largest emitter of greenhouse gases. Leading negotiators have begun to frame COP-15 not as a “make or break” event for climate negotiations but rather the first major step in a two-step process to finalize the framework for a post-Kyoto climate agreement. Redefining expectations in this way takes into account the reality that the U.S. administration is not in a position to endorse a binding treaty until the U.S. Senate has taken up a climate bill that has sufficient votes to be enacted into law. Our largest trading partner, Canada, which did sign the Kyoto Protocol but has not met its targets, is waiting for action in the United States before enforcing greenhouse gas reductions on its large emitters. The negotiations in Copenhagen are organized by the United Nations Framework Convention on Climate Change, an agreement to which the United States is a full party. While the negotiators hunker down in the Bella Center, numerous observers and other interested parties will fill exhibit halls and meeting rooms for the purpose of influencing the debate and demonstrating their capabilities to breathe life into the agreements that are finally agreed to by the member countries. I will participate in one of the many “side events” as a part of the delegation from the International Organization for Standardization (ISO). ISO is an accredited non-governmental observer organization to the UNFCCC. Our session title on 9 December, “Building Governance, Trust & Integrity in the Emissions Market,” highlights the role that international greenhouse gas management standards fulfill. In particular I will explain ISO Technical Committee 207’s standards on quantifying, monitoring and reporting greenhouse gas emissions at the organization and project levels, and ISO’s forthcoming standard on carbon footprinting of products. In addition I will discuss the use of ISO standards for validation and verification of greenhouse gas assertions and explain how an ISO standard establishes a uniform set of requirements for greenhouse gas validation and verification bodies and makes possible their oversight by accreditation bodies. It is critical that mechanisms and institutions exist to ensure the correct accounting of greenhouse gas emissions and emission reductions. And that accreditation bodies monitor validation and verification bodies to ensure that they operate ethically and in accordance with international standards. The United States has already taken a leadership role with the launching in 2008 of a Greenhouse Gas Accreditation Program by the American National Standards Institute (ANSI). ANSI has now accredited thirteen validation and verification bodies to ISO 14065, and the list continues to grow. I serve on ANSI’s Greenhouse Gas Validation/Verification Body Advisory Committee and believe that ANSI’s professionalism and integrity serves as a model for other accreditation bodies around the world. “Counting carbon” is not always as simple as we would sometimes like it to be. However, ISO standards–and the many greenhouse gas programs that both adhere to them and supplement them with additional requirements–play an important role in ensuring that carbon quantification takes place that is accurate, consistent, transparent, complete and relevant.